Homepage. This page: A couple of pre-war magazines containing automobile information of interest to US motorists. Official publication of The Automobile Club of Maryland. These two pre-war motoring magazines turned up recently, and although they aren't in the best of condition, their rarity meant that they'd definitely be going into the old motor magazines section, here at oldclassiccar. 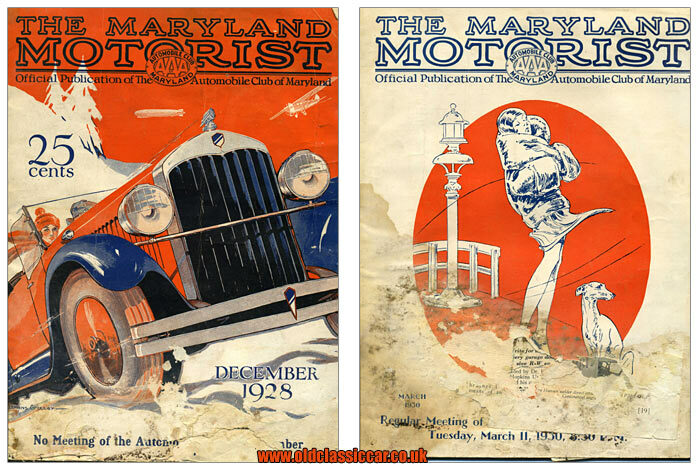 The better of the two Maryland Motorist magazines is dated December 1928, while the other is a little later, at March 1930. They are of course American publications, as is the American Automobile Digest also featured in this section, and each measure 12ins x 9ins. A closer look at the December 1928 issue. Both copies have suffered with damp, and are extremely fragile sadly. The cover of the December '28 issue is illustrated with a great piece of artwork by Clemens Gretter. It features an impressive tourer zooming up a snowy pass, the dame in the passenger seat suitably attired for this winter's day motoring. In the distance, a light aircraft and airship are seen flying by. Coincidentally, the Editor of this publication was a Mr R Jones. The first couple of pages feature advertisements. To the left is an ad for the Bowen System, a method of centralised chassis lubrication: "Would you buy a car without a self-starter? Would you be content to go back to the hand crank? Then why should you be expected to put up with the messiness, inconvenience and hard work of the old-fashioned hand gun method?". Similar designs featured on the more expensive British cars of the 1920s and 1930s, whereby all the car's routine lubrication points could be attended do, via a plunger accessible to the driver. Anyone interested in this system was encouraged to contact the Bowen Products Corporation, of Auburn, New York. Opposite, is an advertisement for "Slidetite" folding garage doors, available to buy from Richards-Wilcox Mfg. Co. of Aurora, Illinois, USA. The content of the magazine is a mixture of advertisements, and articles. The first article, by a Mr George H. Dacy, looks at the problems of driving during the winter months, illustrating his thoughts with various images of model cars sliding down a test slope. Following this 2 page article, is a selection of photographs showing the new car models due in 1929. Shown are examples of Dodge Senior Six Sports Coupe, a Cadillac Fleetwood (a "transformable limousine brougham"), a new 1929 Gardner Series 130, a 2 door Oldsmobile Six, and a five passenger Hupp town sedan, the latter available in either Alcazar maroon, or Wabash Green apparently. Several news items relating to motoring also appear within this magazine's pages. The National Automobile Chamber of Commerce had recently reported that during January - October 1928, a record 4,068,727 cars and trucks had been built in the US, beating the previous record of 4,062,110 from 1926. Production for October 1928 alone totalled 397,000 vehicles, compared to 227,510 in October 1927, an increase of some 170k. The number of vehicles exported looked set to total 800,000+ by the end of the year. Further articles discuss the legalities surrounding motor car lighting, and take note of a growing adoption of hydraulic shock absorbers as standard fitment in new motor-cars. Handily, the Maryland motorist could avail him or herself of a new set of shock absorbers at Edw. S. Warfield & Co. of Maryland Avenue. They would take any old shocks as a trade-in against a brand new set of double-acting Houdaille hydraulic spring controls. Mr Warfield added: ".. the sensational riding quality and speed of the new Ford cars focused world-wide attention on the Houdaille hydraulic double-acting principle. Motorists have become increasingly critical of the riding qualities of the car. This is particularly true of the wives and mothers who spend most of their motoring hours on the back seat, directly over the rear springs." Any article discussing Christmas gift ideas for the enthusiastic motorist always gets a good reception, and in 1928 it was no different. Page 26 is given over to several such ideas, all designed to pry hard-earned $dollars from your grip. First suggestion was the North East Cigar Lighter, a handy invention that ".. you can use without taking your eyes off the road". 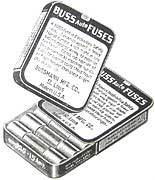 Next, the Burgess "Snaplite" Flashlight, a kit of "Buss Auto Fuses", a selection of "National Mazda Auto Lamps", and for anyone wishing to effect a 'clear penetrating tone' while behind the wheel, the "Robert Bosch Horn". Spark plugs also of this manufacture were also recommended, ".. the same as used on the Graf Zeppelin and very efficient for automobile motors". Other ideas put forward were the "Northeaster" auto horn, the North East "Hot Hed" wireless cigar lighter, and a useful pair of Kraeuter pliers. The "Pull-a-Shade and other useful accessories. Turn to page 30, and some of the latest car accessories are presented. The first is a rear window curtain, operable from the driver's seat by pulling a cord that ran over various pulleys, to the rear of the car. This gadget was known as the "Pull-a-Shade", and was designed to lessen the problems of driving at night with badly-adjusted headlamps shining in your rear view mirror. The control unit comprised a bakelite housing mounted above the driver's head somewhere, from which a cord ran to the rear. To operate the rear shade, you simply pulled a second cord, onto which a small ball was fitted. Designed to help new drivers was a gear shift guide, which looks like a chrome-plated guide (Ferrari style) attached to the floor, through which the stick-shift gearlever protruded. One very neat idea is a range of tyre pressure gauges produced by the U.S. Gauge Co. of New York. They ".. hit upon the expedient of providing his gauges with separate and distinct dials giving the pressures recommended for the different models of a given make of car". The gauge shown as an example was designed for Studebaker owners, the gauge face listing pressures for the Studebaker Commander, Dictator, and the Erskine. The perfect 'shop' for the lazy motorist. Lazy motorists, wanting drive-in everything, is nothing new as a small piece at the back of the magazine demonstrates. A driver in his 20's tourer, possibly a Buick, is seen driving through the first 'auto market', situated in Louisville, Kentucky. The idea was you could do the weekly 'shop' while never leaving the car. Rotary display units offer the goods to the shopper, with purchases checked by a cashier as the driver drives by. Fortunately "ample ventilation" was another feature of this drive-in store. I wonder how long it lasted?